There is something compelling about the site of a bird in nature ... It's a unique beauty that can't be improved upon. This guide will help you capture your subjects and their habitats realistically, in a variety of mediums. "I have always thought that as painters we are only limited by how much we can see," writes author Bart Rulon. And to help you make the most of your fieldwork, Rulon offers invaluable advice and instruction on sketching, photography and on-site painting. Throughout, you'll be inspired by the work of some of America's top bird painters working in oil, acrylic, watercolor, pastel, colored pencil and mixed media. Nine step-by-step demonstrations show how artists bring a variety of subjects to life. In addition, you'll find ideas for using shadows, unusual poses, action, lighting and camouflage to create unique and interesting paintings ... scenes that convey a sense of true wonder at the beauty and drama of the moment. 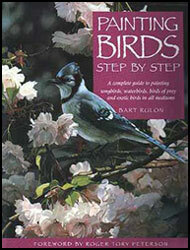 "Most of us choose to paint birds because we are fascinated by them. Watching a bird behaving naturally is uniquely inspiring. Painting is the best way to recreate these experiences and to communicate a sense of 'being there' to others."